There are 18 species of bat in the UK, all of which are protected by law since they have been in serious decline in numbers over the last century. One of the reasons for this is the loss of habitat. Barns have been converted into houses, and modern dwellings tend to be far more carefully ‘sealed’ than those of 100 years ago. Churches, however, have remained as they were and – anecdotally at least – it would seem that whereas bat numbers generally are going down the number roosting in churches is significantly rising. Much as those of us working to conserve historic buildings, and in particular works of art in churches, might love bats, generally it cannot be denied that their presence can cause real problems. Bat excreta can stain and chemically alter wallpaintings, textiles, monumental brasses (and other metal fixtures and fittings) and even marble. Larger roosts can result in a huge build-up of droppings which can be nigh on impossible to keep on top of by regular maintenance. Protective covers, even where practical at all, can be a visual disaster. 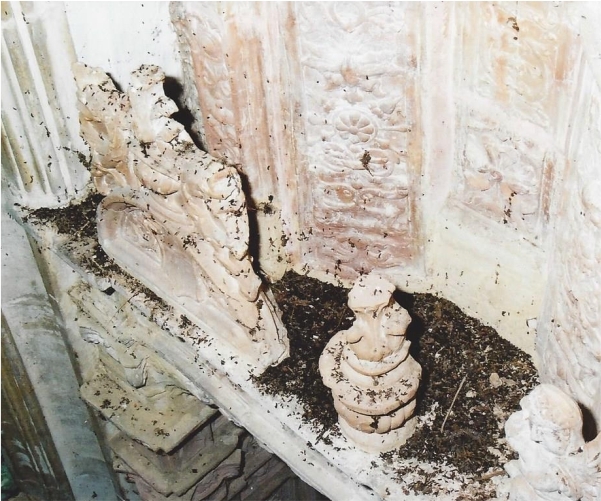 Meanwhile there are potential health issues with bat excreta which can have an impact on the use of a church. The protection given to bats and their habitats makes it a really tricky problem to deal with, yet bats are so widespread in churches that they seem to be present in just about every church we work in! What we are doing isn’t always directly impacted on by bats but it certainly can be. We were plaster conservation sub-contractors at Litcham church (Norfolk) in 2013-14, when works to the roof were halted due to bats being found, and where the presence of bats is known then re-roofing and tower repair works often have to be scheduled for the winter months – with much greater risks posed to the work by inclement weather. 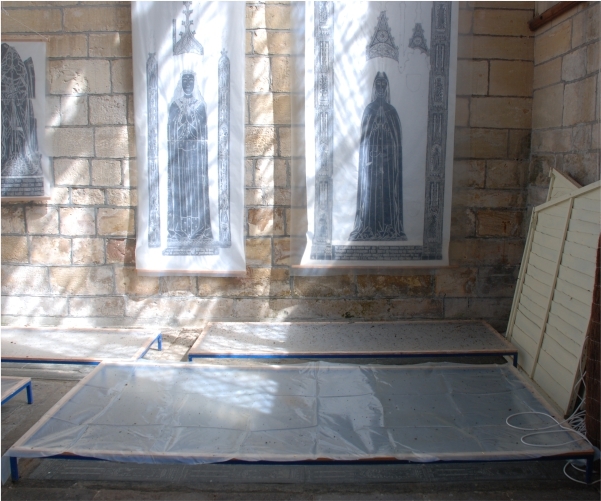 At Skillingtons our biggest concern though, because it’s our specialist area, is the impact of bats on monuments – both free-standing and wall-mounted stone monuments and ledger slabs in the floor, often with brasses. Sometimes we can take preventative measures such as applying microcrystalline wax, but this requires regular (costly) maintenance and although it may be viable for marble, alabaster or metal may not be for more porous materials. We believe that what is needed is a better understanding of bat behaviour so that control measures can be taken to manage where bats roost without having a wider and detrimental impact on bat populations. There are various research programmes to this end in progress, which we are following as closely as we can. In the meantime we are supporting work by the Church Monuments Society to make a list of churches in the UK with monuments affected by bats. We would be pleased to pass any examples on to the CMS if you email us directly, at admin@skillintons.co.uk. 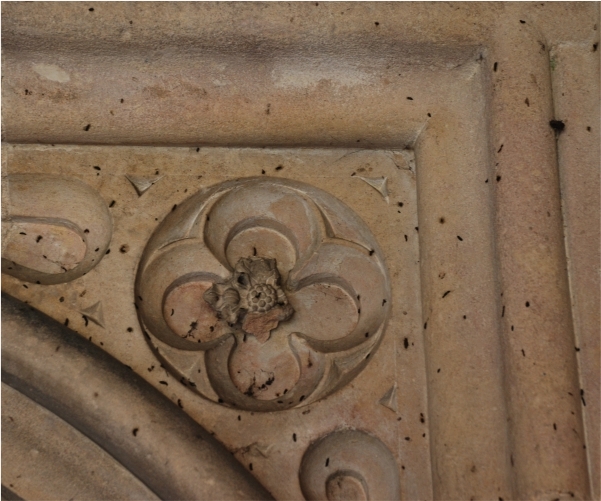 Bat droppings on an early 16th century terracotta monument at Oxborough, Norfolk.